With his successful crossing of the English Channel this morning, Joe Zemaitis became the latest swimmer to achieve the Triple Crown of Open Water Swimming. In addition to seven lake swims in the S.C.A.R. Swim Challenge [shown above] in his native Arizona, the Strait of Gibraltar, and the International Self-Transcendence Marathon-Schwimmen in Switzerland, the 37-year-old completed his Catalina Channel crossing in 12 hours 57 minutes. He finished seventh in the 20 Bridges Manhattan Island Swim in 7 hours 45 minutes and he became a Triple Crowner with a 12 hour 23 minute crossing of the English Channel. Zemaitis described his latest channel crossing in 63°F water where he landed in Calais, France shortly after midnight, "The English Channel went pretty well. I was #5 in the window since I only got a slot last year so was pretty sure I would have to swim on a spring tide and sure enough. The first 10 hours were great, then felt like I was just swimming in place the last 2.5 hours. Since I had a midday start, I finished in the pitch black and couldn't see the jellyfish anymore; I got hit a couple times so that was demoralizing. Still, it was a great experience." He is now heading to Maui for his next solo channel crossing in Hawaii. His hunger for endurance has been a big part throughout his entire life. He was on the swimming and cross-country (running) teams at his high school and completed the 1998 Hawaii Ironman Triathlon at the age of 18, setting a course record for 19 & Under and becoming the youngest ever to finish in less than ten hours. After graduating from Lake Forest College in Illinois, Zemaitis returned to Arizona and started Swim Neptune, a competitive swim team at the Village Health Clubs in Scottsdale and Phoenix. It has grown to over 600 swimmers and won the Arizona Swimming Age Group State Championship eight times since 2010. While spending most of his time on pool decks instead of swimming in the water, Zemaitis has coached dozens of swimmers who have competed at the collegiate and national level. 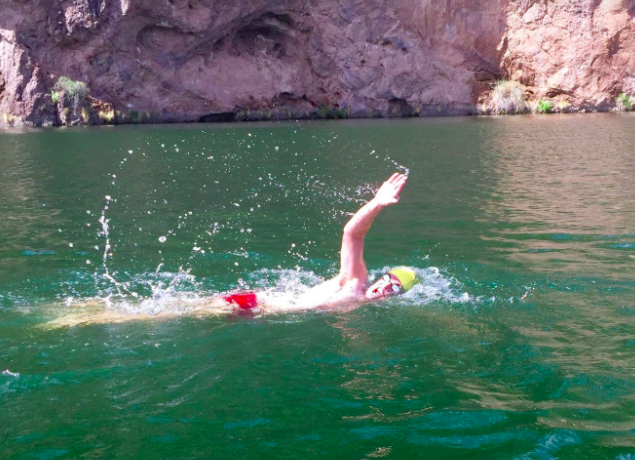 While the success came quickly in the pool, open water was never far from mind even being located in the desert of the American southwest. In 2006, Zemaitis coached 7-year-old Braxton Bilbrey to become the youngest to swim from Alcatraz Island. This launched the Swim FAST program, now entering its twelfth year, to train over 500 swimmers ages 8 to 75 to swim from Alcatraz to San Francisco one day and across the Golden Gate Bridge the next day. Zemaitis made his return to open water swimming by swimming the Strait of Gibraltar in 2013, then finishing second overall in the 26.4 km International Self-Transcendence Marathon-Schwimmen in 2015.